The Story: The Land Transport Authority (LTA) has announced that the Certificate of Entitlement (COE) quota for the August to October period will increase, up from 8,202 a month currently to 9,225 a month. The average monthly COE quota for Cat A will increase from 2,867 to 3,328. The average monthly quota for Cat B will shrink from 2,559 to 2,529, while the average monthly quota for Cat E also shrinks from 1,113 to 1,055. The LTA has not changed its stance on the zero growth policy. The total vehicle population has remained at 907,156 since 31st December 2017, and will remain so for the foreseeable future. While the headline might seem to indicate that COE quotas are increasing across the board, this is actually not the case. For passenger vehicles, only the Cat A quota will increase. The numbers may be slightly misleading, as 586 out of the 1,023 (57.3%) additional COEs are actually Cat D (motorcycles). It's prudent to look closely at the numbers before rushing to any conclusions and/or buying decisions. This adjustment in COE quota will likely have minimal direct impact on COE premiums moving forward, as well as minimal impact on the overall price of cars. If you are already thinking of purchasing a new car, now is probably the best time to do so. COE premiums for Cat A are likely to see a jump in the next couple of bidding exercises, so there is no value in playing the waiting game and hoping that Cat A premiums will continue to fall. However, if it's a Cat B car you are after, COE premiums aren't expected to increase significantly in the next couple of biddings, so you can afford to hold off on your purchase and see if premiums might fall further. The recent significant drop in Cat A COE premiums to $25,000 has already seen customers flocking to showrooms. Buyers may mistakenly rush to the conclusion that this increase in COE quota will directly result in a decrease in premiums, and that car prices will continue to fall. However, this is unlikely to happen. Actually, a quick look at the numbers from LTA show that the 'increase' in COE quota is merely due to an increased number of vehicle deregistrations for Cat A and Cat D. The increase in the COE quota is simply to replace the number of deregistered vehicles for the May to July 2018 period. Demand for Cat A cars may even be artificially inflated in the near future, which will likely result in higher premiums for at least the next couple of bidding exercises. 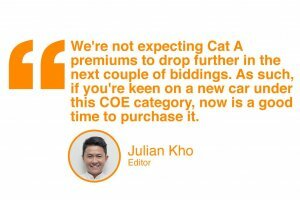 We expect COE premiums for Cat A to eventually stabilise around $30,000. For luxury brands like BMW and Jaguar Land Rover, which sell mostly Cat B vehicles, the slight reduction of the COE quota for Cat B and E will likely continue to suppress sales. Conversely, brands selling Cat A vehicles, such as Volkswagen, stand to benefit. 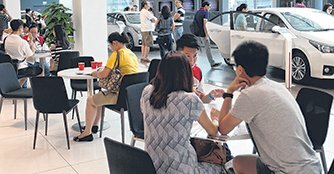 According to Mr. Daniel Chong, Sales General Manager, Volkswagen Group Singapore, "The demand has been very good since the prices of COE fell last week, and hopefully the increase in COE supply will help to absorb some of the Cat A premium increase that is expected due to the increased demand."